A baby memory, and a recurring dream of my childhood this one. I am gently rocking, in and out of sleep, on something moving. Sounding a bit like a train, but much more ‘woody’ than the steel rails I will come to hear later. I am on the Liverpool Overhead Railway, and my disappointed parents are taking one last ride as they’ve just heard it’s being closed down. It’s mid 1955 and I am one year old. As an adult they will tell me about this shortly after I’ve identified the ‘woody’ sound in my dream as the sound inside the overhead railway carriages. I hear a recording in a museum, I think it’s the old ‘Large Objects’ down at the Princes Dock, and I’m taken back to being a baby again. 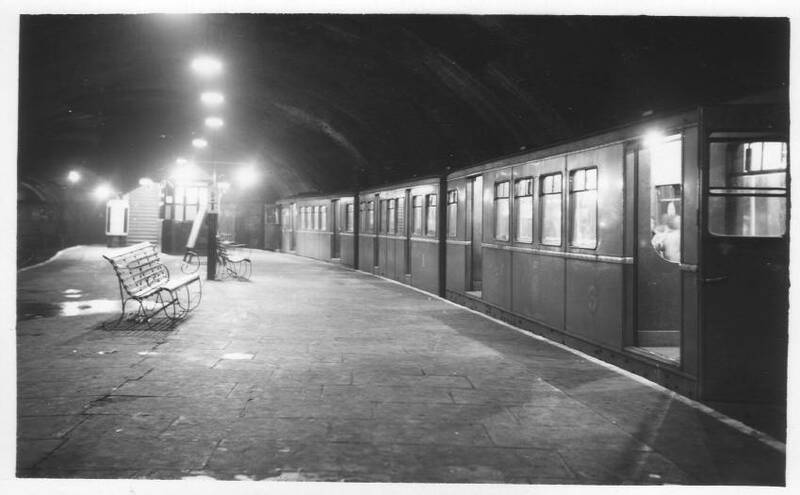 The Overhead closes at the end of 1956 and is demolished by the middle of the following year. This act of gross municipal vandalism enrages me more and more as the years go by. 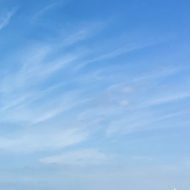 And I feel the Overhead, even now, as a great thing missing from my life. Checking its dates earlier I watched an old film, with tears in my eyes for the missing memories. The southern end of the overhead began underground. Dingle Station was later used by Roscoe Engineering. And I remember coming here a couple of times, around ten years ago with Sarah, who was having her Citroen 2CV maintained by them. 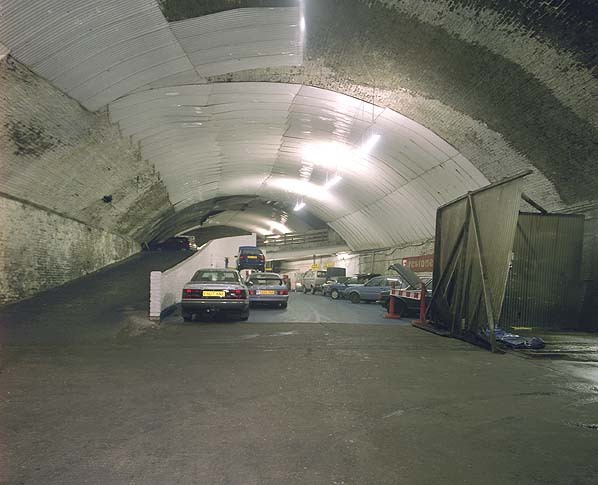 They’re gone now and some of the tunnel has recently collapsed. With cars still in there. 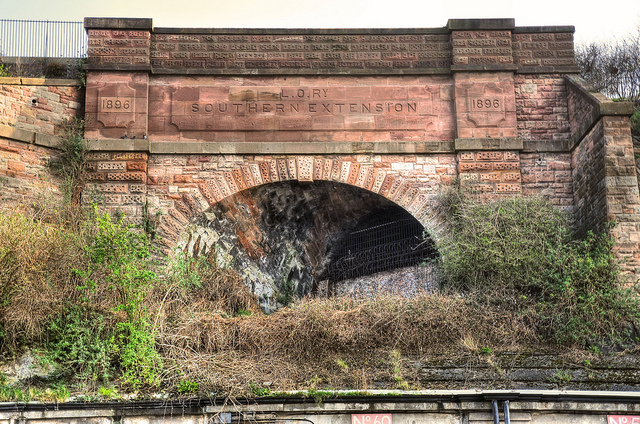 Overhead trains would emerge near to the Docker’s Steps and above the Herculaneum Dock. Remembered in stone. L.O.R. 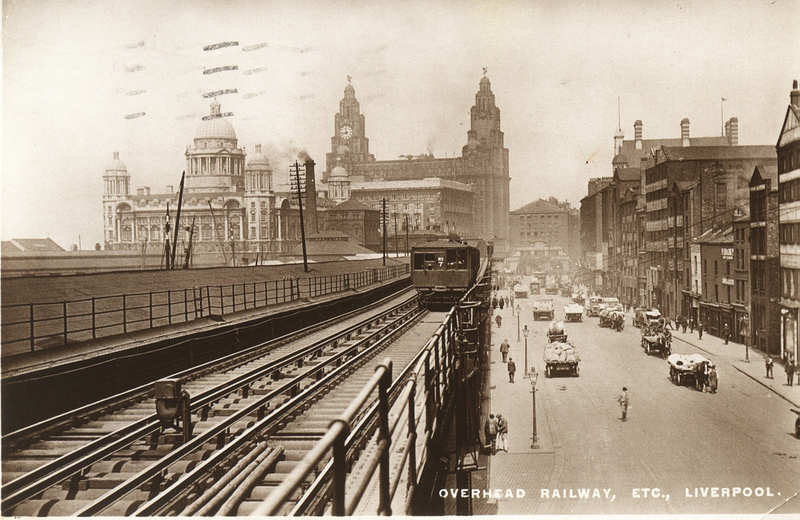 The Liverpool Overhead Railway. 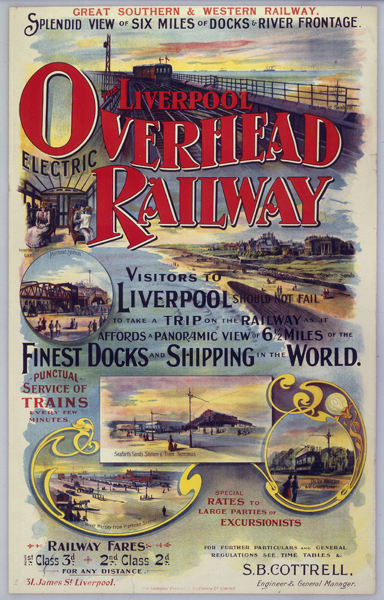 In Liverpool now, there is very little physical evidence that the world’s first electrically operated elevated railway was ever here. Just this tunnel and a couple of girders set into dock walls further along. Just imagine if we still had this now. The delight we’d have had in this magical way of getting to town and beyond, and seeing all the docks. Steam trains working the docks would run underneath the Overhead, no doubt adding further to its gradual rusting. When the rest of Britain’s railways were nationalised in 1948, the newly created British Railways refused to take on the rusting Overhead. And in 1955 Liverpool City Council refused to support the proposed £2 million refurbishment. And by 1957 it was being demolished. But once it was one of the wonders of the world. 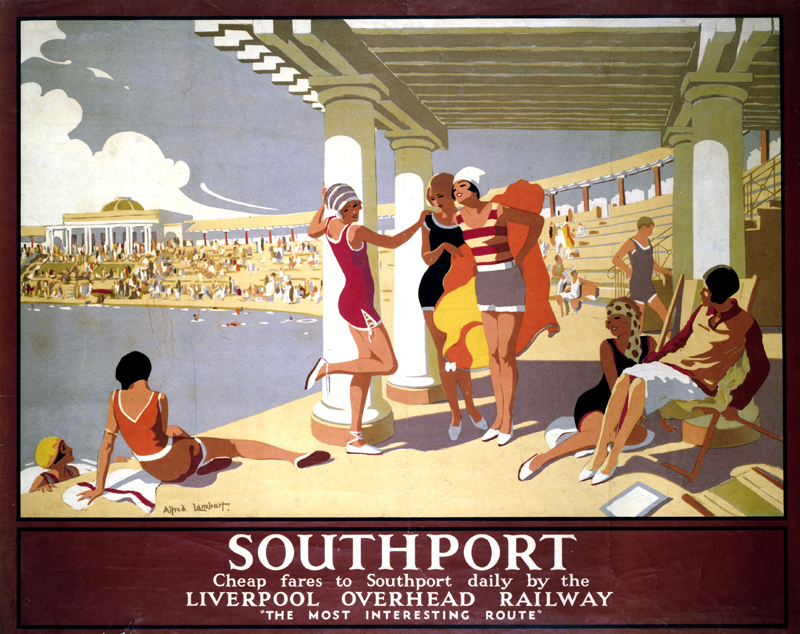 And in the early 1900s collaborating with the Lancashire and Yorkshire Railway you could ride all the way to Southport or go to the races at Aintree. 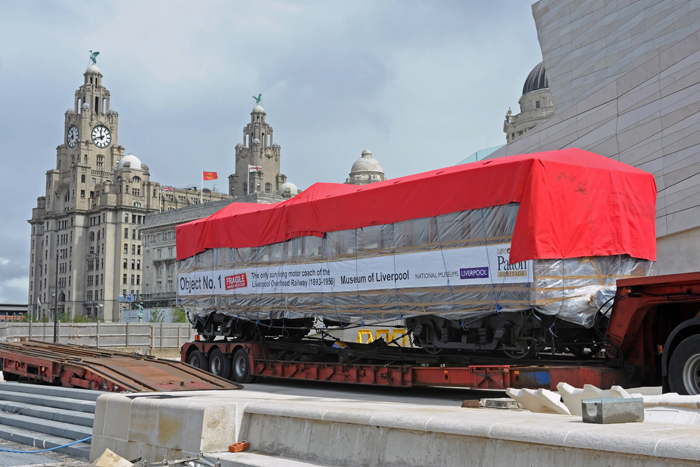 But now the only surviving Overhead carriage has arrived at the Museum of Liverpool. So I can go and sit in it and remember being a baby again. I’d rather be riding on it and filming from it, though. With a lifetime of memories behind me. Sweets in the 1960s. Or, where did all those fillings come from? Oh Ronnie, you keep on doing this to me, I can still smell those trains and the smell that was down in Dingle Station. The smell as you walked down the sloping passage to the trains. Starting work in Birkenhead Tannery I went by train to Canning Station and then the underground to Green Lane. And that early train would be full of dockers, every one of them smoking Woodies or Players Weights, and a cloud of smoke about three feet off the floor upwards. I remember the dockers in the warehouse at Herculaneum station who threw a pile of oranges to me when you were lucky if you saw them in the shops. The days out to Seaforth Sands with my mother, so we could “swim” in a puddle left by the outgoing tide. That was the Costa Brava to us kids. Thanks for these precious memories Stan. I can see that cloud of smoke and remember when that was what public transport was like! Ronnie this is a fascinating piece of Liverpool past , certainly municipal authorities were guilty of numerous acts of vandalism in the 50s and 60s. 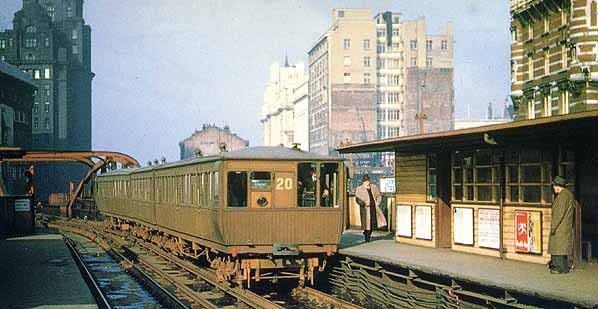 Apart from the pleasure of riding the overhead railway how sensible to have a raised mode of transport in cities. Such an efficient way of getting around and no congestion. Another piece of very shortsighted vision. In New York, I’ve seen part of the old overhead railway that was used to transport goods to the docks that has been transformed into a very attractive walk through garden. 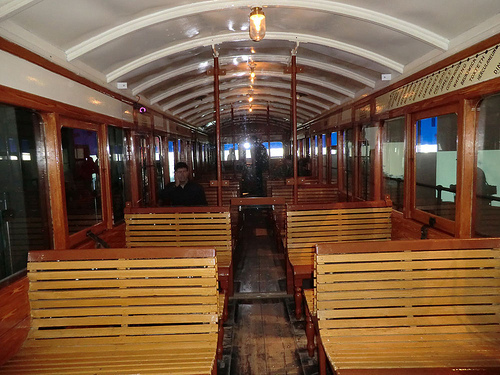 I liked the restored carriage but it should be carrying passengers above the streets of 21st century Liverpool. 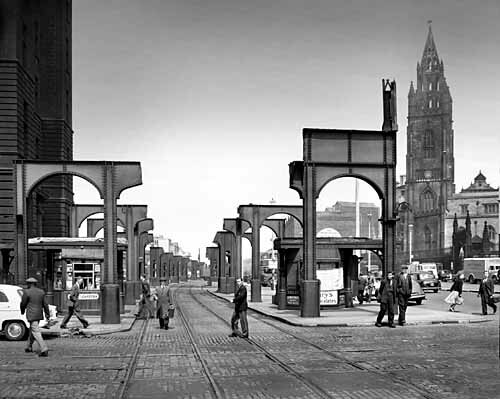 I only came to Liverpool in 1967, but I nevertheless feel a sense of loss when I read about the Overhead and see photos of it. A sad loss indeed. Shortsighted indeed. Lovely account though, Ronnie. Thanks Mandy, Gerry and Lindsay for your comments. We all miss it, though none of us really saw it. My own memory hardly qualifies as ‘seeing it’ really. I’m planning a trip next spring to Liverpool and hope to say hello then. Very good to hear from you Mitch, I don’t think I’ve ever had contact with anyone from Indiana before. Your pictures of one of the Chicago lines being renovated nearly brought me to tears, they looked so much like our own Liverpool El would have looked by now. I hope you’ll find some of my other posts useful in getting familiar with Liverpool before you come over next spring. And do come and say hello when you do. Ronnie and the group. Thank you for your cordial reply. I’m originally from Chicago born 1950. But out here in Indiana we’ll deep fry anything. I’m glad you enjoyed the photos of the “L”. That’s the “Blue” line that runs to O’Hare airport. It started as the Logan Square branch of The Metropolitan West Side Elevated. The line went in to service as an electric line just after The Overhead in Liverpool started. As a child I rode our wooden stock, and later at a museum I’ve operated them. The first thing I thought when looking at photo of LOR was how much the line was like our own. I’ll be looking at more of your posts and I’m sure we’ll meet next year. I’m sure we will Mitch. Sorry that all I’ll be able to show you of our Overhead is a tunnel opening and a few metal uprights in dockyard walls. But Liverpool’s a beautiful and interesting place, so I’m sure you’ll have a great time anyway. The Dingle Tunnel would be my first stop. I’ve watched enough You Tube clips of the Overhead that I’d be a qualified driver if it were 1950. Looking forward now… And I’m sure it will be a great time. 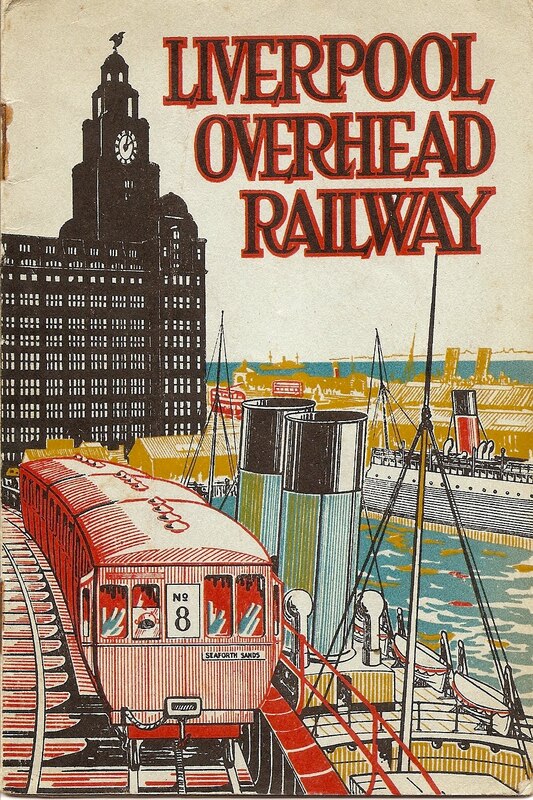 My only trip on the Overhead Railway was on a school trip in the early 1950s – the names of the four ‘houses’ in Childwall Valley High School being the same as four of the docks. Later, I knew a young man who worked for the engineering firm that carried out the demolition of the Overhead as he lodged near where I then lived. 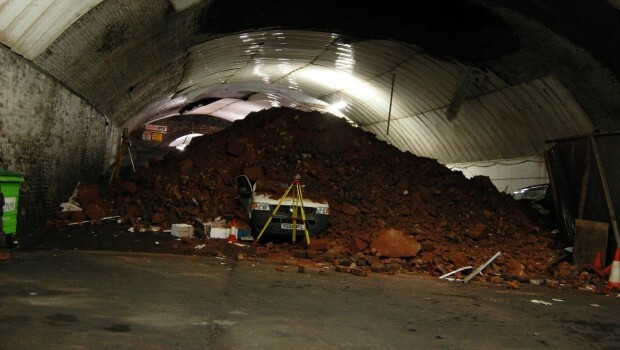 He’d gained his Civil Engineering degree from The University of Liverpool.